Can I fix my leading edge or strut myself? Yes and no. It really depends on the size and location of the damage. If the damaged are is larger than 2" we recommend getting it repaired by a professional repair center like fixmykite.com. Leading edges and struts are more prone for small damaged areas to spread very quickly. The reason being that these areas are under pressure from the bladders. How do most leading edge and strut damage occur? Most leading edge and strut damage occur from the leading edge or strut coming in contact with shells or any other sharp debris. This mostly happens from someone launching your kite and dragging the leading edge or strut on the ground. Another source of leading edge and strut damage is from self launching on an area with objects that the leading edge and strut can get cut on. Crashing your kite on objects or hard surfaces will cause damage to your leading edge or struts. Another source of leading edge and strut damage is from over inflation. Some maufacturer's recommend pumping kites over 7psi. Anything over 7psi especially in larger kite is too much pressure. When a kite is overinflated the stitching starts to cut into the dacron and then eventually causing a leading edge or strut blow out. How does fixmykite.com repair leading edges and struts? 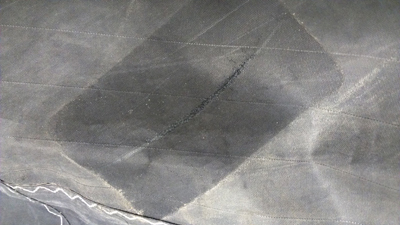 Here at fixmykite.com we use two layers of dacron to repair damaged leading edges and struts, one layer on the inside and one layer on the outside. We unstich the leading edge or strut seam, so we can put a layer on the inside of the casing. Then we stitch the dacron to the casing and close the leading edge or strut seam. Now that area is twice as strong as factory. That is why we guarantee our repairs. How can I prevent damage to my leading edge and struts? Always check your launching and landing area for any items that can cause damage to your leading edge and struts. Also make sure that who ever is launching and landing you, that they DO NOT drag your kite on the ground. If you are trying to learn new tricks make sure you're in an area that doesn't have objects that will damage your kite.